The Blue Spruce Motel in Murrysville has become something of a landmark. In its heyday its pool was “the” place to go to swim. Located right beside Route 22, the pool was hard to miss. Unfortunately, in later years the pool was known for its chipping paint and being abandoned. Times weren’t always bad for the Blue Spruce Motel. In fact, it wasn’t even always the Blue Spruce. 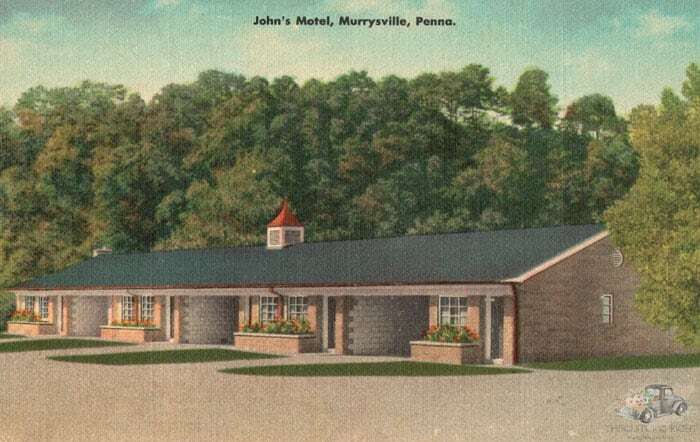 In the 1940’s the property was home to John’s Motel. John’s Motel went through several transformations over the years before it was purchased in 1956 for $7,500 by Camille Naffah. 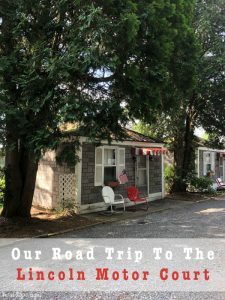 Mr. Naffah torn down the original John’s Motel and built the Blue Spruce in its place. The new Blue Spruce Motel was a single-level motel featuring fairly simple architecture. The new motel featured a large swimming pool which attracted swimmers from all over. 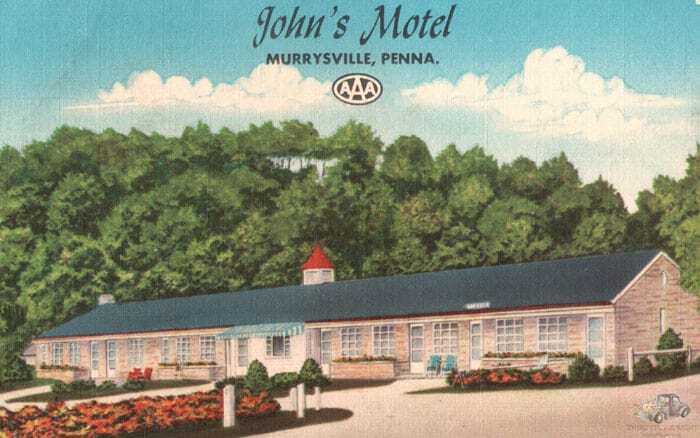 A vintage matchbook cover which shows the original John’s Motel on the top portion and the Blue Spruce pool and pool house at the bottom. 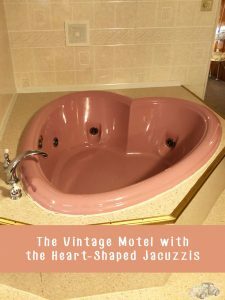 As with many hotels and motels of that time, the pool was a big draw and you didn’t necessarily have to be staying at the motel. Patrons could purchase admission just for swimming. A large poorhouse was built alongside one edge of the pool. This sort of private swimming pool was ideal since there were few other public pool options at that time. In the 1980s a second story was added to the Blue Spruce as well as a bar and restaurant. Mr. Naffah kept an apartment on site, right above the motel’s lobby. A map to the Blue Spruce Motel was on the inside of the matchbook cover. The motel received notoriety — and a facelift — in 1996 when it was used in the movie “Kingpin”. The building was repainted blue and pink when it played a part in the movie. The pool area to the motel closed in the early 2000s, and Mr. Naffah tried unsuccessfully to sell the motel in 2005. The motel closed in 2007 with the death of Mr. Naffah. 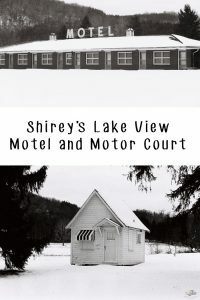 The motel was left to an employee, Emily Moroney, who also died the same year. 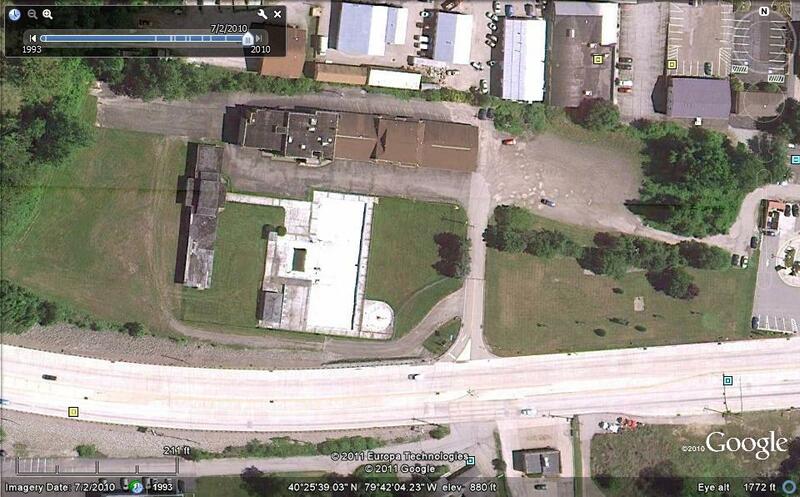 A Google Maps view of the old Blue Spruce Motel after it was abandoned. The motel and pool were left to deteriorate for a number of years. Each year, the paint in the empty pool continued to chip more and more, making it something of an urbex landmark. The estate of the Ms. Moroney approved the demolition of the site in 2011 in order to make the property more marketable. Two years after the demolition of the motel and pool, the area was redeveloped into a shopping area complete with restaurants such as the North Park Lounge, Burgatory, and Moe’s Southwest Grill. The shopping center is aptly named the Blue Spruce Shoppes, a reminder of the motel and pool that used to live at the site.